Please complete the form below and your enquiry will be sent directly to Coot Cottage via email. Your enquiry has been sent to Coot Cottage. 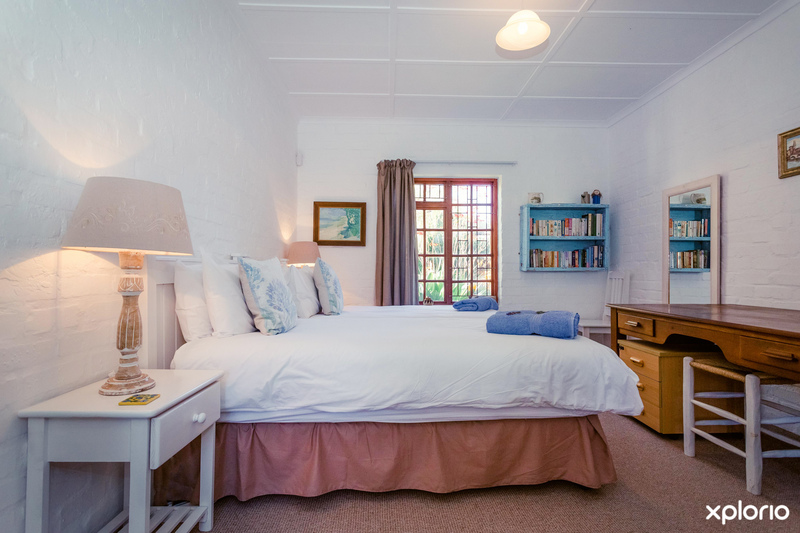 Coot Cottage is your self-catering home-away-from-home when you plan your next getaway in the picturesque town of Stanford. This stylish two bedroom cottage lays nestled in a tranquil garden and there is an added studio apartment available by prior arrangement. Coot Cottage offers luxuries such as crisp, white percale linen and large fluffy towels that will ensure you feel pampered throughout your stay. Take a stroll into the village and enjoy village life through the eyes of a local as you explore all the quaint shops, galleries and restaurants that are just waiting to be discovered. Top wine estates and the picturesque Klein River are just minutes away and this spectacular countryside promises outdoor enthusiasts unlimitless amounts of good, clean fun. Coot Cottage sleeps a total of six guests. Children of all ages are welcome. Click on ‘More Info’ below to find out more about Coot Cottage. Coot Cottage has a lovely big terrace with a braai, table and chairs, making it perfect for entertaining and dining el fresco. The walls of the tastefully decorated lounge and dining area are graced by original oil paintings done by local artists. There are bookshelves that are laden with books and a DVD collection that are all at your disposal. The cottage boasts an indoor fireplace. The two bedrooms each have two single beds that can be joined to create a king size bed. There are two bathrooms, each with a shower, basin and toilet. The spacious fully fitted kitchen has a dishwasher, fridge/freezer, microwave, food processor and a washing machine. The Studio is a separate luxury bedroom that has a queen size bed and two lounge chairs. The bathroom has a shower, basin and toilet. There is a coffee station and a fridge. The Studio can be booked separately by prior arrangement. Minimum stay of two nights out of season and four nights in peak season (Christmas and Easter).